Google's gone a bit quiet regarding news on its Project Tango tablet, leading us to wonder if we might not see a 2014 launch after all. But lo and behold, the development kit tablet has just shown up on the Google Play Store. The bad news - you're not allowed to buy it. Yet. 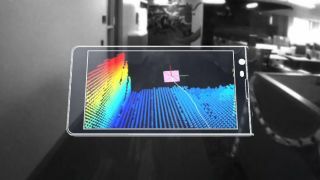 For the uninitiated, Project Tango is Google's interesting take on the future of tablets, which uses cameras and sensors to map its surrounding environment - and the things in it - in 3D. The potential applications are exciting, but for now all we know for sure is that the tablet packs an Nvidia Tegra K1 processor, a 1920x1200 7-inch screen (at 323 ppi) a 1MP rear sensor, 1MP front-facing camers, 4GB of RAM, and an impressive 128GB of storage. Unfortunately there's no word on pricing or availability, but hey, the fact it's there at all is a good sign, right?